YPT National is pleased to present another installment in our YPT Mentor Interview series. This week we talk to Debra A. Johnson, Deputy COO for the LA Metro. Debra has more than 20 years of diverse experience in the transportation industry. Ms. Johnson began her unconventional transportation career as a public participation specialist working in the private sector for an engineering consulting firm. She later transitioned into government relations and executive roles in public transit agencies. Besides here current role at LA Metro, Debra has held varying positions with the San Francisco Bay Area Rapid Transit District (BART) the Santa Clara Valley Transportation Authority (VTA), the Washington Metropolitan Area Transit Authority (WMATA) in Washington, D.C., and the San Francisco Municipal Transportation Agency (SFMTA). She is an alumna of the 2000 Class of Leadership San Francisco and the 2008 Eno Center for Transit Leadership’s Executive Development Program. Ms. Johnson is the immediate past President of the Northern California chapter of the Conference of Minority Transportation Officials (COMTO), an immediate past member of the California Transit Association’s Executive Committee, a member of the Women’s Transportation Seminar (WTS) and a member of Urban Habitat’s Board of Directors, in addition to Urban Habitat’s Board of Directors’ Finance Committee. AP: Thanks again for your time, we here at YPT really appreciate this opportunity to talk to you. How did you first get interested in transportation? DJ: It came to me through my interests in policy and public administration. It just so happened that I had a job at an engineering consulting firm, and the project I was working on was in transportation. Through that project I was first exposed to public transit. I was involved in all the community relations and government relations work with different municipalities, neighborhood councils and stakeholder groups. I had the chance to present issues in front of regulatory agencies and government bodies as well as other organizations that had regulatory oversight. I clearly saw the nexus between transportation and the environment and it peaked my interest. I’ve been doing transportation now going on 22 years. AP: By industry definition you’re still considered young, and we here at YPT would definitely consider you one of our own. How have you been able to create a sense of authority, be an expert in the subject matter and progress through your career so quickly? DJ: I happened to work on some dynamic projects, work at some great agencies, and forge some great relationships. I will always put my best foot forward. Through some professional organizations I’ve been able to attend conferences and be part of leadership groups. The first opportunity came when I was at BART, working in community relations. There was a delegation being put together in the Bay Area to go to Sacramento where the State was considering taking away a ½ cent tax measure, which was a revenue stream for BART. Another colleague was unable to make it. I volunteered to attend in their place and was given the opportunity to present to Antonio Villaraigosa, Speaker of the California State Assembly at the time. When briefing the BART board on our findings, the board recognized that I could very much handle myself in a high-pressure situation. It was a very lucky opportunity for me where I could showcase what I was capable of. Through networking with peers and colleagues, I’ve been able to put together a “kitchen cabinet” of people across the industry. I’ve been able to work with very dynamic people. There were lessons learned about what to do and what not to do. That helped me put my best foot forward and take chances and be the risk taker in the way in which I could learn from past mistakes and leverage them on a go forward basis. AP: In learning all these lessons yourself, was there any specific advice you received, so you didn’t have to necessarily experience your own mentor’s mistakes? Anything you were able to take and run with? DJ: I’m not a technical person, not an engineer, not a planner. I’ve more or less come up the softer side through policy and government relations. An engineer I was working with told me “I may build the ‘thing’, but you have to sell the air it sits in.” When I’m interacting with technical people who may not understand what someone from a communications background can contribute, I have to convince them of the importance of the administrative point-of-view. When you’re building a massive infrastructure project such as the BART SFO extension, you have to keep in mind the ramifications of not doing everything to code and allowing deviations, how people like me can keep technical folks out of trouble. When I’m interfacing with all the different contingencies, like the SF mayoral staff, or Sacramento, or interacting on Capitol Hill with our congressional delegation these are things that I can do for you so you can plan and design your project. Being able to work with everyone and respecting each other and what their respective contributions are. Whether it’s service delivery or building new projects, you have to have an understanding that one aspect of something, can not survive within itself. You have to have ancillary functions and sound policies that ensure the collective effort can forge ahead. AP: The infrastructure is just the tactics, but the policies are the strategy that drives and incentives behavior. A bus is a bus and train is a train, but what incentivizes different usage and behavior. DJ: Exactly! That’s the change I’m trying to affect daily. Just because we used to always do something one way doesn’t mean that will work for today or tomorrow. Why don’t we do it this new way? Lets look at this and examine. Looking at the new authorization bill, it’s so imperative that we adhere to things we’re doing with our labor unions because of continuing resolutions in the labor code. We are a public entity and not a profit organization. Are we doing anything that will have residual impacts based on our operational characteristics? AP: You mentioned the “kitchen cabinet”? Can you explain that further? DJ: I adopted it from Bob Prince who was the first African American General Manager at MBTA in Boston and is currently with AECOM. I went to the Executive Leadership Transportation program through Eno. While Mr. Prince was talking to my classmates, he mentioned that when you move up the food chain through a large bureaucracy, you’re the only one at the top and you won’t have a peer. It’s imperative that you create relationships through the industry. You’ll need a large network of people you can go to outside the bureaucracy. Taking that advice to heart I have made connections with colleagues who worked at other agencies, as well as colleagues on the private sector side. I can go to my “kitchen cabinet” and pull something down when needed. I had to go to the “kitchen cabinet” just yesterday. Here at LA Metro we had an incident in the very early hours of the morning. I had to pull people together for immediate mitigation actions and assess what happened. I reached out to my colleague who was COO at two major agencies. I was able to do my due diligence with his input so we can come out of this and reduce the likelihood of a similar incident going forward. AP: Over the course of your career what is the single project or task that you would consider the most significant accomplishment so far? DJ: Coming from the Bay Area to work in DC for WMATA, I learned that their organizational structure was created by Congress, i.e. a multijurisdictional compact. In California you have the Brown Act, sunshine laws, FOIA, etc., when I went to WMATA they did not have public comment at board meetings or committee meetings, no town hall meetings, no forums in which the actual constituents, could actively voice content or discontent for whatever program or service we were providing. I led the charge to have a voice for the general populace in regards to going to board meetings, having public comment, starting the first ever town hall meeting. I developed a rider’s advisory council in conjunction with the Sierra club that still exists today. The council members are appointed by representatives of their jurisdictions. They represent the voice of the riders through VA, DC, and MD. AP: What’s the biggest risk you’ve taken so far in your career? DJ: Definitely moving across the country, working at different agencies and having to learn entirely different agency cultures. It’s hard to continue growing and not become complacent in your current role. When I got a call about the job in DC, my friends and family warned me “You don’t know anybody! You’re going somewhere without any family or friends” but it turned out well for me. Just go! Weigh the opportunity, especially if it’s an opportunity for promotion and increased responsibility. 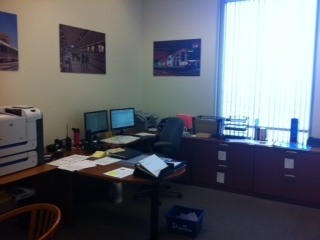 AP: As part of this mentor series, can we post a picture of your workspace? AP: Thanks again for your time Debra, this has been great. DJ: Absolutely, anything I can do to pay it forward.